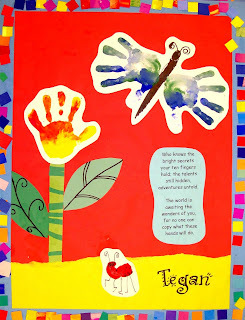 This is a fun end of the year project I create with my Young Fives kindergartners each year. 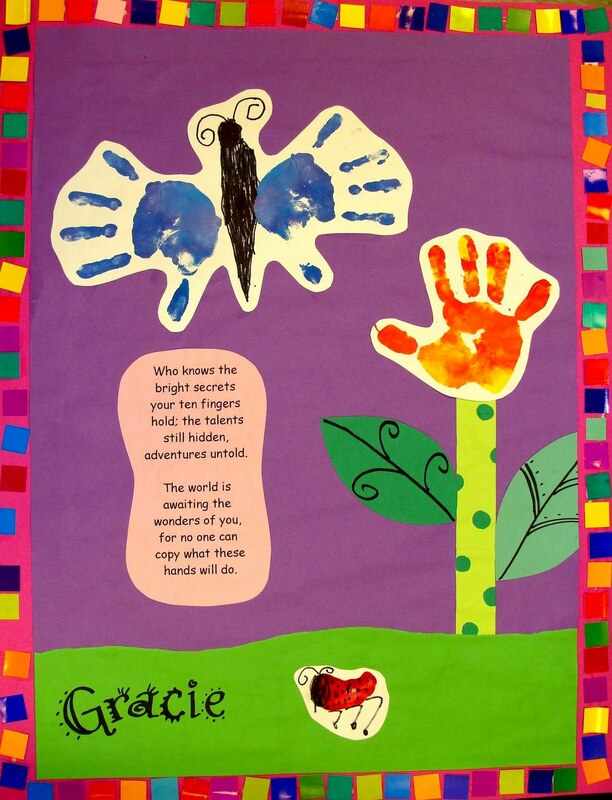 We use their hands to create the butterflies, tulips, and ladybugs. Note to self: Take more photos of the process next year!!! 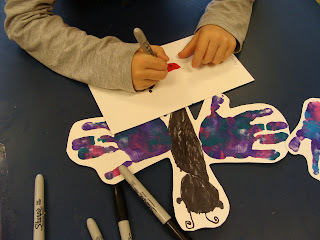 First, the students draw the butterfly body on a white piece of tag board. I direct them through this process, step by step. Then, I put three colors of tempera in a tray (I usually have 4 different trays to choose from) and have each student come back and place one hand in the tray of paint. They LIGHTLY pat their hands together so that both hands are covered in paint, but the paint remains unmixed. 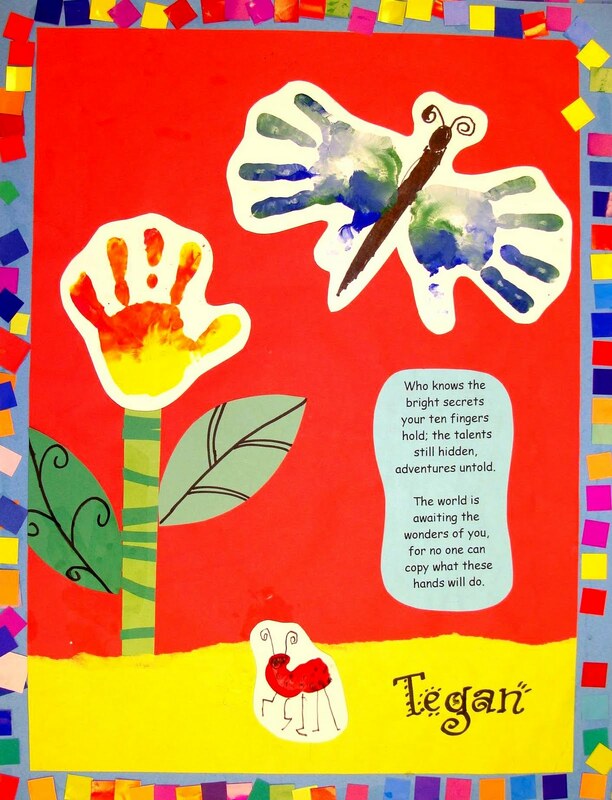 I guide their hands to the paper to print the wings of their butterflies. Remember, thumbs down! After washing their hands, the students come back to the trays and choose another paint color tray to use for their flower. 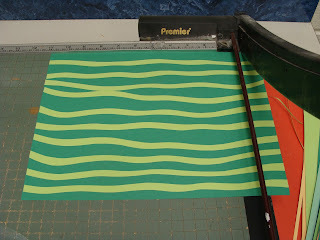 This time, one hand is places in the paint and then is directly placed on a scrap piece of card stock or tag. 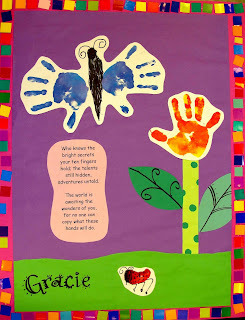 I then have the student make a fist with their clean hand, dip the edge in some red paint, and print the body of their ladybug. Of course, they wash their hands once again! 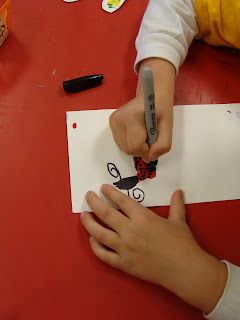 During the next class, the students draw the head, antennae, and spots on their ladybugs using black Sharpie. Before class, I have "bubble-cut" (cut close to the object, keeping the shape, but not cutting on the line) each butterfly and flower for the students. Of course, you could have the students do this part. By the time we get to this project, I am usually pressed for time, so I often do some prep ahead of time. Another thing that I do ahead of time is make the stems. Again, the students can do this step (minus the paper cutter!) if you choose. I cut wavy strips from green construction paper, glue them to another green paper, and cut them on the paper cutter in 1" strips. Sometimes, I do polka dots also. 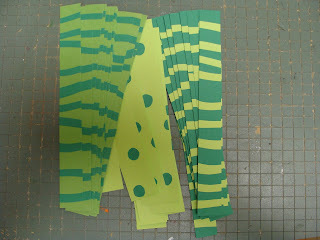 The grass is a piece of 12" X 18" green construction paper torn in half. This is glued to the bottom of an 18" X 24" piece of construction paper. The stems are glued on to one side, tucked under the grass. A leaf (simple tear drop or rain drop) is glued to each side of the stem. 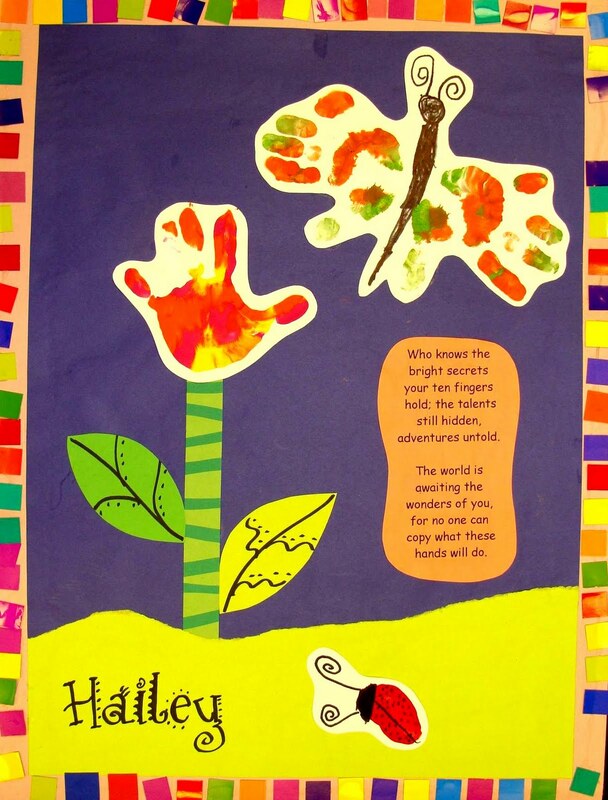 Their tulips are glued to the top of the stem and the butterflies float in the sky above. I also add a poem to their project. I am not sure who wrote the poem, but I have used it for years! What these hands will do. I have mad the poem available, in PDF form and ready to print, here. I copy it on to colored paper, just to make it more interesting. The ladybugs are glued in the grass and I write their names in a funky font. The students could also do this step. 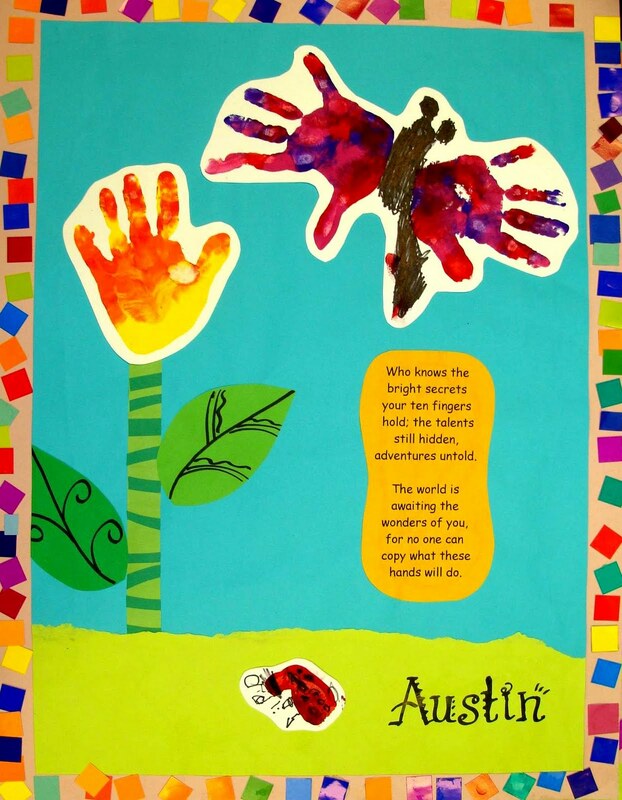 To finish off their projects, we glue them to a posterboard and add a mosaic border. I use these mosaics because they are brightly colored on both sides. Although they are a little bulky, the students always manage to get them home and I know the parents love them! 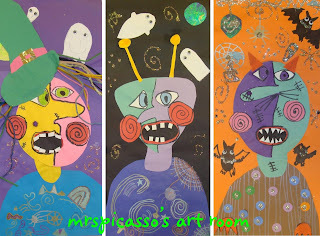 View our entire gallery on Artsonia. so ADORABLE!!! I just love this project. 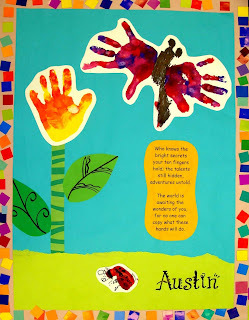 I print my 2nd graders hands for one project. The parents just love their little hands! Another Great project! Thanks for sharing I will be doing this next year def!!! Here is the link: I gave your blog a shout-out. 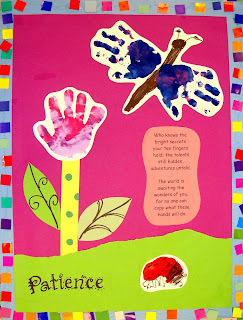 Maybe some Belgian kinderarden teachers will find their way to your blog this way! Can you elaborate on what your other kids do during this process? I would love to try this but don't quite know logistically how to put it together. 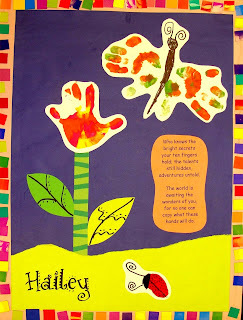 Saw this on Pinterest- how cute and colourful! I love personalized projects like this one- parents will treasure it. This process goes very quickly (and I only have 15 in each class) so the others line up and watch as we do the handprints. They could work on a coloring page or have some free drawing as an alternative!